Title page, from the journal "291"
The displayed works of Marius de Zayas are first published as part of the magazine 291. The magazine was published in New York from 1914 to 1916 as an arts and literary magazine. It was created and published by Marius de Zayas and a group of his friends, Alfred Steglitz, a photographer and modern art promoter, Agnes E. Meyer a female artist, art collector, journalist, and poet and Paul Haviland, a photographer, critic and arts patron.The magazine was initially intended as a way to promote Stieglitz's gallery of the same name 291. Due to the high potential of the artist evolved, the magazine soon became a work of art in itself. The shown examples are exclusively by Marius de Zayas and show his introduction of Visual Poetry to America. 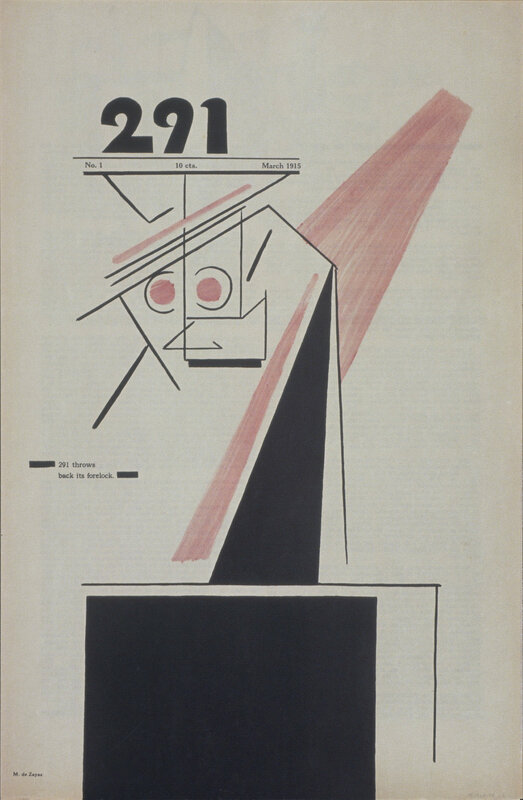 The magazine published original art work, poems, essays, and commentaries by John Marin, Francis Picabia, Ribemont-Dessaignes, Max Jacob, Georges de Zayas, Stieglitz and other Dadaist and avant-garde artists and writers of the time.